Chuck also brought up Keith Costas, and the bad luck he had during the event. At the event, he crashed not 1 but 2 large planes, a large Topflight Curtis P-6E Hawk and Martin B-10 that weekend, both gorgeous planes. His Planes Crashed for one reason, Nicad Battery Conditioning or lack thereof. …his batteries hadn’t been cycled in quite a while, and he didn’t put a load meter on the battery to check it, even though they were charged, they couldn’t stand up to the strain put on them by the servos and electronics. Prevent crashes by cycling your Ni-cads if they haven’t been used in a while, and put a load meter on it to check them. Horizon Hobby sells a load tester for $35, which is capable of putting up to a 2 amp load on your batteries. Most volt meters will only check the batteries voltage, which might be fine with no load on them. But once you start putting them under the strain of running several high torque servos and a receiver, they may not be up to the task. This is cheap insurance and something everyone in the hobby should have and use if your running a separate battery for your receivers, servos or even ignition. There is quite a bit of Junk ending up near Prado due to illegal dumping. If you see anyone dumping stuff, please call the Parks department, or call one of the board members. The Locks will be fixed soon, so we will be able to lock the Front gate to prevent some of this. Tom Marcure, Talked about the newsletter, and that we still need an Editor. However. For the past couple months, I, Tom Callahan, have been doing the writing. It’s a lot of work for one person to come up with interesting content every month. The board agreed, so in an attempt to alleviate the burden on one person we are asking everyone to help out. Anyone who would like to contribute an article to the newsletter can do so. There will be a significant prize raffle at the end of the year for those that contribute an article. 1 article gets you 1 ticket into the drawing. The board has not decided how much the prize will be but it should be significant. Currently we offer a $250 and $350 end of the year raffle for those that bring in an Airplane or something to share at the meeting. Articles can be about anything RC related. Maybe a review of an ARF you bought, a new build, or new piece of equipment. You can share some wisdom on a particular skill or technique. Maybe you went to an RC event and would like to write about it. There will be more information on the website to come about this so stay tuned. October is Big Jolt, and Classic Pattern and AMA Pattern. These are in the Planning stages. But they are coming up fast. 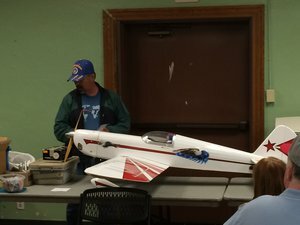 Randy Wilbur Brought in his Beaver to talk about flying it at the event. 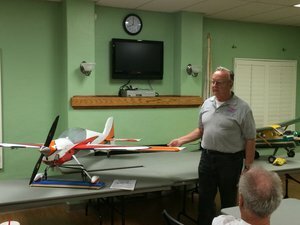 , He was able to Fly it 2 times at the event. He put 5 LBS of lead in the nose, and that wasn’t enough. So 6lbs 10oz was the final weight to balance it out. Randy also had some battery issues which cause the motor ignition system to foul a bit, but once the battery was charged, the Airplane flew great. Lonnie Brought in his new large pattern looking plane with a DA 60. 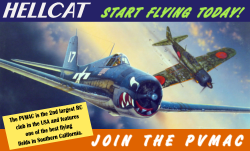 He explained that It, like most aerobatic planes today, was designed for 3D, so he Cut down the control surface throws and resolution to allow it fly more like pattern and less like a 3D plane. He will be taking it to pattern and classic pattern events. It handles well in the wind. All up weight is 17LBS. Gas tank is right on the CG, and the plane balances perfectly without weight. It needs to be large so he can see it well. Cal Orr brought in his brand new Mark III Kwik-Fli, hot off the bench and which was built from tattered plans he had from the 1970’s. It’s a classic pattern ship that took about 80 hours to and is modeled after the one Phil Kraft flew to win the Nats in 1967. 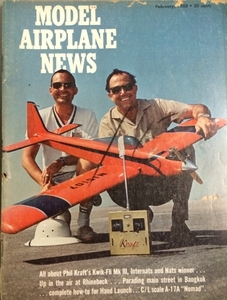 At the time, It was featured on the on the cover of the February issue of Model airplane news in 1968, and Cal brought that magazine in in as well. It sports a 5S 5000Mah Pack, an 80A Esc and a 3525/10 780kv Cobra brushless Motor from Innov8tive Designs, which draws 45 amps. With an all up weight of 5 LBS and 8.5lbs of Thrust it has unlimited vertical. 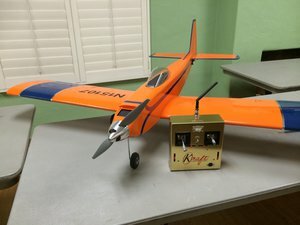 He also has the actual radio model that Phil Kraft actually flew with during the nats, which he converted to a JR 2.4 system. The Sticks were very stiff compared to what we have on today’s radio. He put a magnetic hatch above the motor, but found out that when you hit a certain RPM it will eject due to the magnetic field that is created around the motor. He flew it once that day, and reports it flies just as great as the others. Oscar Brought in his new Spektrum DX8. He spoke about his Spektrum DX6i which has been problematic. cHe talked about all the issues he has had, It crashed 3 planes. It was sent to Horizon to be fixed. He ended up put a bad review on horizon website about the 6i. But he still ended up buying a new DX8 based upon Good reviews the DX8 had on the horizon website and the features set it offered. He realized that his Bad review for the 6i had been erased by horizon. So he’s hoping that the DX8 is actually a good radio, but is worried that horizon has removed all the bad reviews about the product on their website. He will be selling his DX6i on Ebay, you can find it listed under OSCAR777, if your interested in a radio that has been responsible for crashing 3 planes. Joe brought in a is selling a Super Sportster with a 82” wingspan For fellow pilot Gene, that passed away. It has a DLE 30, weighs 16 LBS He is asking $360, Flies Great, floats in like a trainer.